Around sixty tones of predominantly shiraz and merlot, along with small amounts of mourvedre, grenache, viognier, cabernet sauvignon and petit verdot, are harvested to produce the wines. 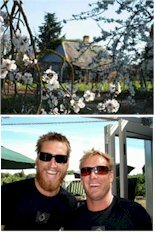 From pruning through to budburst, flowering, fruit-set, veraison, harvest, fermentation, pressing, barrel aging, blending to bottling, the whole 'winegrowing' process is carefully tended by Rob Gibson. His university education in both oenology and viticulture, combined with his 23 years experience at the prestigious Penfolds Wines and a natural curiosity of all things, have led to an intimate understanding of the many factors that can influence the creation of wine. Rob, or 'Gibbo' as he is affectionately known by his friends, has managed to engage the tireless efforts of his wife Anne, as well as the energy of their five children; Kelly, Kim, Adam, Sam and Abel in the family business. Anne is responsible for all that is involved in getting the wines from the winery into the bottles and then out into the world, a list of duties that normally requires the resources of an entire staff. Over the last few years, Rob has developed a number of different wines; amongst them Shiraz, Sparling Merlot, and his signature Merlot. 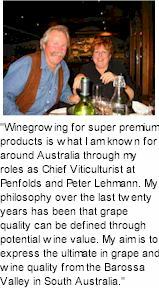 Most of them have been made from selected vines from his own plantings in the Northern Barossa. Rob's wines are divided into 3 different ranges. The BarossaVale Range is the winery's original range, featuring the highly successful Merlots. All the wines are highly rated, and have done well in recent reviews, including Runner-up in the prestigious Jimmy Watson Trophy for the 2003 Shiraz. The Gibson Reserve Range is Rob's Signature Range. All the vines are highly rated. They have been very carefully selected by Rob from all the vines picked and all the Barrels made in the vintage. The Australian Old Vine Collection are super precious jewels of International standing, and are hand crafted form Australia's Original Old Vine Gardens on a very small single barrel scale.